My name is Amelia Gray. In order to protect myself, I've vowed to return to those rules. But the ghost of a murdered cop needs my help to find his killer. The clues lead me to the dark side of Charleston--where witchcraft, root doctors and black magic still flourish--and back to John Devlin, a haunted police detective I should only love from afar. Now I'm faced with a terrible choice: follow the rules or follow my heart. Amanda Stevens lives in Houston, Texas, with her husband and a black cat named Lola. She is an avid reader, a fledgling taphophile, and a collector of Alfred Hitchcock memorabilia. When she s not writing, she likes taking road trips through the South. 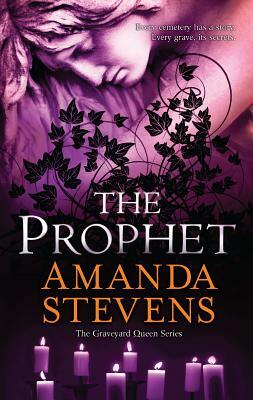 You can find her online at www.amandastevens.com"
"This is paranormal romance done well." "The beginning of Stevens' Graveyard Queen series left this reviewer breathless. The author smoothly establishes characters and forms the foundation of future story lines with an edgy and beautiful writing style. Her story is full of twists and turns, with delicious and surprising conclusions. Readers will want to force themselves to slow down and enjoy the book instead of speeding through to the end, and they'll anxiously await the next installment of this deceptively gritty series." -RT Book Reviews on The Restorer, 4.5 stars "Top Pick"
"Stevens makes her MIRA debut with this taut, disturbing story. The characterizations are vivid, and it's got a lovely twist in the tail. Not for the squeamish!" "Faced paced and plotted with spectacular precison and guile, this is undiluted suspense at its very finest. Nervous readers should read it in full daylight." "Stevens' swiftly-moving, intricately plotted story has oodles of twists and chills-plus a jaw-dropping shocker of an ending. This is good stuff indeed."